Former US Secretary of State John Kerry is set to publish a memoir of his years in the White House, the Jewish Insider claimed. I can't help it. Whenever I see Lurch in the public eye, I just gotta heap scorn on him. Force of habit from back when he was relevant. I just think of Heinz Ketchup or a rabbit with a pancake on its head. Kerry is a dedicated enemy to Freedom. Did he say anything about his stepson becoming a multi multi millionaire while John was selling the SOS office? Selling? I guess I meant occupying. Lurch has obviously gotten Netanyahu mixed up in his mind with Hillary Clinton. Will his legacy be anything other than “gigolo”? Or maybe “low IQ”? “Traitor”? No one cares, husband of Teresa. I’m sure Kerry and Obama couldn’t wait to do for Hamas what they did for Iran. And The Swamp was just fine with it. It might have been a secret agreement to Lurch, but that doesn’t mean Netanyahu is held to the same standard. Last I checked Israel was a sovereign country. Anything JZfKwrry was doing was destructive to begin with. A Memoir of John Kerry’s years in the White House? I’m sure the sales figures on that will be impressive. 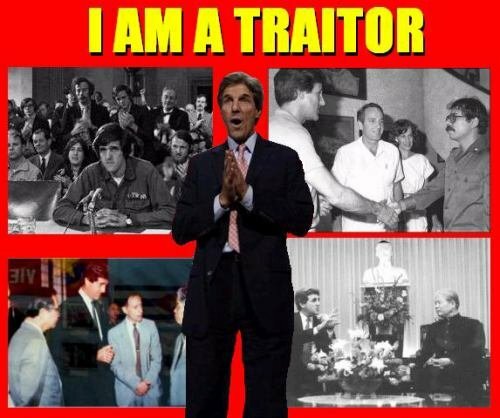 That lowlife Kerry doesn’t have any credibility. I’m not buying it. He lies like a dog. The Iran deal signed Israel’s death warrant and Mr Swiftboat is upset at a mere leak? 0bama hated Israel as only a muslim could. Kerry was no better. The poor bastards in Venezuela don’t have any paper to wipe their *** and yet the left just keeps publishing these fag books for liars. Geez. Fox’s Charlie Hurt got an advance copy, photographed it thrown into his waste basket and put it up on Twitter. I love Charlie! Bibi Netanyahu needs Mossad to play a practical joke or two on John F’in. Something that will inform Lurch that his attitude is noted and that telling the truth at all times is important.